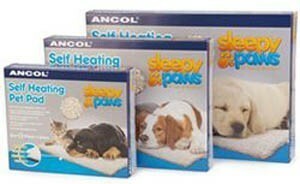 Details: Ancol Sleepy Paws self heating pet pad, soft & cosy sheepskin style cover, super reflective core insulation with outstanding thermal performance. Perfect for keeping your pet warm in winter, add to any bed or simply place on the floor. Machine washable cover.